"You have always been their salvation, their hope in every generation... to make known that all who place hope in You shall not be put to shame..." A song of triumph, traditionally recited at the conclusion of the Megillah reading. In Song of Songs, the Jewish nation is compared to a rose. Shoshanah (rose) is a reference to Shushan, recalling the verse "the city of Shushan celebrated and rejoiced" (Esther 8:15). 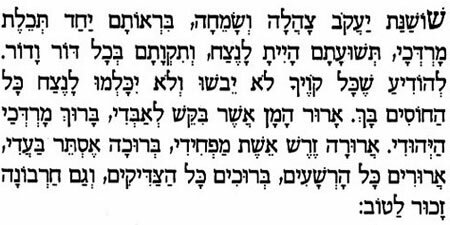 It is a custom to recite the Shoshanat Yaakov hymn after the Megillah reading. The words are also used as a basis for traditional Purim songs. The rose of Jacob thrilled with joy and exulted when they beheld Mordechai garbed in royal blue. You have always been their salvation, their hope in every generation, to make known that all who place hope in You shall not be put to shame, nor shall all those who trust in You be disgraced forever. Cursed be Haman who sought to destroy me; blessed be Mordechai the Jew. Cursed be Zeresh the wife of [Haman] who terrified me; blessed be Esther who [interceded] on my behalf. Cursed be all the wicked; blessed be all the righteous; and may Charvonah also be remembered favorably. Shoshanat Yaakov, tzahala v’samecha birotam yachad tchelet Mordechai.